I tend to break a lot with these sorts of projects, but I have kept up with screencaps at least and have a small backlog now. What have I been doing? Raiding, making gold, pet battling. I've spent more than half a million this xpac already, and I'm currently 40k shy off being back at the 1mil mark. BMAH y r u so tempting?! OH is Fan of Fiery Winds but I don't consider it as part of the outfit. It looks nice anyway. It was nice to see the mace drop on our first Will of the Emperor kill, and as you can see I was the lucky recipient. The mace is lovely - the ball spins and lights up - so I decided to find a matching outfit. I opted for the BC Windchanneler's shoulders solely because I put a lot of work into getting them, trying to match them to the outfit in my first post and it didn't work out. They match my hair and the brightest blues on the dress so it works out nicely. Otherwise this outfit is a lovely coming together of two expansions that are really quite far apart, Pandaria having no contact with the scourge of Wrath. And yet, Wrath offered the best match to this Pandarian weapon. As a side note, I'd like to point out that the off-hand is a unique model. Pick it up if you ever see it cheap. The adorable Dragon Kite popped up on the BMAH yesterday. After a hefty bid war, I picked it up for 92k. I named it Cost a Lot. It can't battle, but that's okay because the blue version matches my outfit. The other three colors it can be are nice too. Sometimes it's hard to be a raider at the beginning of an expansion. I've consumed a lot of my time getting geared up appropriately for our first raid week (4/6 is okayish). Unfortunately it means I neglected my mogging and this blog. I still sort of am. I will neglect the other items I am wearing as they aren't what I want for this outfit, but I don't have the time this week to farm them. Those shoulders are no longer in the game. They are the priest T3 shoulders and they popped up on the Black Market Auction House. Things worth noting: old gear pieces all seem to come up for 10k, regardless of item slot. 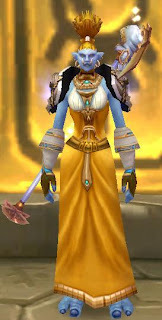 These shoulders cost me 16k and a repair bill as there were three other priests bidding too. 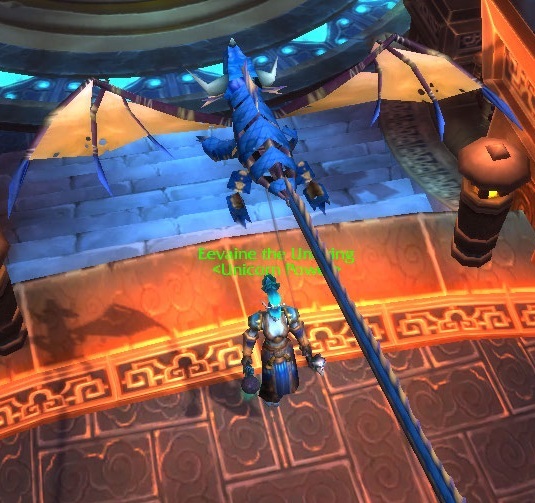 One of them was Alliance, which I thought, "Oh yeah, they've been saying they put this AH away from the prying eyes of the city," I'll roll 'em since I'm on a PVP server. Oh no. The exchange guards in the AH get quite upset by this and do attack. So there won't be any PVP battles for this stuff, just the good ol' fashioned waiting. I have had that chestpiece sitting in my bank, unequipped, for quite some time now... waiting for something that would look nice with it. Those shoulders are great. I'm quite in love with it and hoping to finish the rest of the outfit. There's a lot of old tier gear no longer available in game popping up on the BMAH. If you have the gold, be sure to check daily. With the revamp of Scholomance, we seem to have lost yet even more mog items. But I hold onto a smidgeon of hope that they'll put the models back in, some of them, maybe in Heroic... maybe. Maybe, right? Also missing from this new Scholomance are Dark Runes. Maybe you've seen them before, and if you have you most likely vendored them. If you didn't... hold onto these. They are used in some crafting patterns for a few nice pieces of transmog gear, notably to me is the Darkrune Breastplate. There are matching gloves, also crafted, but that's it for the set. You'll have to match up the rest on your own, which I am in the process of. But back to my point. I put off getting this chestpiece for far too long. It was the last Symbolic look-a-like color deviation I needed and because it was crafted I thought I'd just get it when I was farming out in Silithus. Well, I got the plan, but not before DARK RUNES WERE REMOVED WITH THE REVAMPLED SCHOLOMANCE. They drop no where else. When I realized, I ran frantically to the AH - after all, it's still a recent change, maybe there's some left. None. I asked in guild. No one had any. I ran to the other faction AH - one, for 2g, which I quickly bought. I spammed trade on both sides with a simple WTB Dark Rune and got only one seller... who only had one Dark Rune. I needed a total of 16 for both the chest and the gloves. All right, pack rats, what amount will make you give them up? That's right. WTB Dark Rune x14 14k. I got them very promptly from one of the AH players. Officially the most I've paid for transmog gear. I guess that evens out all the absolute bargains I've gotten. Just in case you are unaware, the majority of mobs in an instance do not de-aggro or "leash". So you can round up just about the entire instance and AoE them down. No problem. But that's not the case out in the open world of Azeroth. There are some good spots where mobs are grouped and whatnot, but most of the greens they drop just aren't that great. The mobs that drop the best stuff - like Jade plate - aren't that well grouped. Can't round them up too well with damaging abilities either at max level because you one-shot them. Shamans, aggro mobs with Purge. In order to kite them around and gather a few mobs, tab between the mobs and keep Purging so they don't just evade back before you're ready to kill them. 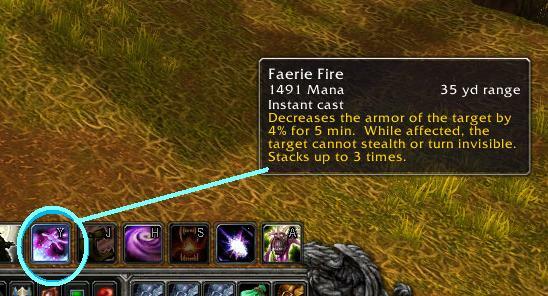 Druids, stay out of form and do the same with Faerie Fire. Tooltip has changed since the recent patch, but the small amount of damage it does is utterly insignificant and will not one shot mobs. Not any one of these classes/don't have one/don't want to farm with it... hope isn't lost. 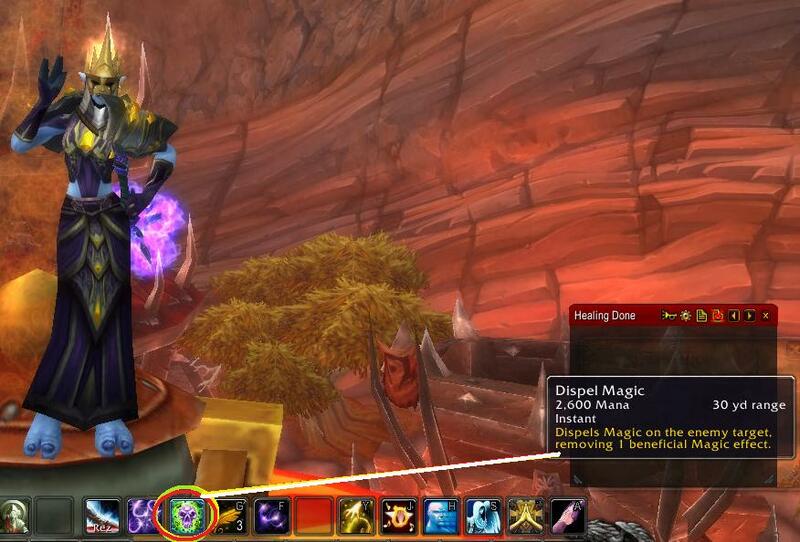 Warlocks, use a dot spell that does not do initial damage - quickly tab between mobs and apply this dot before it ticks damage. (I am assuming the dot can go only on one target at a time, thus gaining aggro while dealing no damage.) Warriors, Paladins, and DK's, use your taunt. Paladins and DKs can even use consectrate/death and decay. Hunters, use distracting shot and slowing traps. 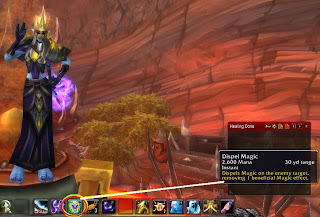 Mages, I do not have one of you and thus do not have a picture, but you can use Spellsteal in the same manner as Purge, Faerie Fire and Dispel Magic. Rogues... Nobody loves you. Please help yourself to a chocolate chip cookie. Now that you know how, where do you go? Un'Goro. Silithus. Winterspring. Best bet is Un'Goro and the Stegadons, as elite mobs have a higher chance of dropping greens. It'll still be long, tired, and somewhat unrewarding. Farming is not for everyone, but it gets you some gems if you persist. 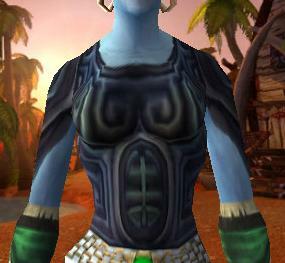 There are shoulders that non-priests can get. They drop off of Heroic Nefarion: Mantle of Nefarius. Alternatively, if you don't like or don't have access to these shoulders - how dare you NOT like them - there is another pair of sensible shoulders that matches up with the robes: High Councillor's Mantle. 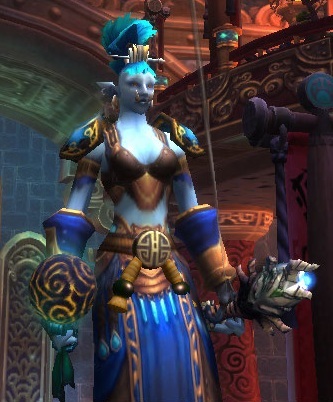 This outfit seems like it might be more suited to a Draenei who can better match the hair color to the greens of the dress. I enjoyed it simply for the novelty of running around with fountains on my shoulders. 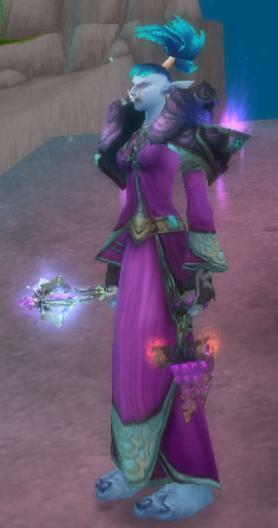 Right about the time I acquired the robes and discovered how nicely these shoulders matched was right about the time the guild decided to go back for some old titles. As a priest that meant three chances at the shoulders! Heroic Nefarion was not forthcoming with the shoulders, but he was kind enough to only wipe us a handful of times. Heroic Cho'gal was also not forthcoming with the correct tier token, so down we went to spend the night with Sinestra who graciously died after a couple hours of derping with cutters. It was Heroic Al'akir that decided of all the different item tiers he could drop, of all the different class tiers he could drop, he would bestow me with exactly what I was after. I think he appreciated that I was one of the three left alive... or he was as tired of listening to me whine for purple toilet bowls as the rest of my raid.